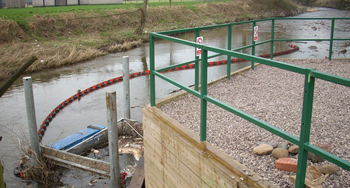 The litter trap boom was released yesterday as a temporarily measure to protect the equipment as there have been problems with the boom movement in high flows. Possible adjustments and modifications are being considered to ease movement of the boom. We intend that the litter trap will be back online and working more effectively as soon as possible. Since April 2007, we calculate that the litter trap has removed 21 tonnes of litter and debris. Litter and debris the litter trap removes would otherwise spread downstream through Pleasington, Hoghton Bottoms and Higher Walton, into the River Ribble at Walton-Le-Dale. Around the Grosvenor Development - Jan 08, originally uploaded by National Museums Liverpool. Check out the latest image of artist Ben Johnson's 'Liverpool Cityscape' - an enormous painting of the city which has taken the artist and his team 24 000 hours so far. The painting is currently at Johnson's London studio, but it will be moving to the Walker Art Gallery, where he will be artist-in-residence from 28th January until 7th March, enabling local people to see the techniques used on the painting in action. The cityscape will then form part of a major exhibition at the Walker, 'Ben Johnson’s Liverpool Cityscape 2008 and the World Panorama Series', which will also feature paintings of Jerusalem, Zurich and Hong Kong amongst others. Its eventual home will be the new Museum of Liverpool. Entries are now being sought for the Northwest Business Environment Awards 2008. Do you know any green heroes who might be in with a chance? Galloping climate change, Batman, there's no time to lose! Samantha, the intrepid salmon who travelled to Ulan Bator with Green Team 2CV in summer 2007 is currently travelling the world with a variety of companions. 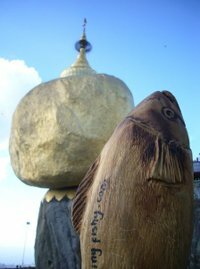 You can keep track of her journey by joining Samantha's very own Facebook group at www.travellingfishy.com. I have good news – I have received an update about your solar panel and laptop and have attached some photos for you to see. 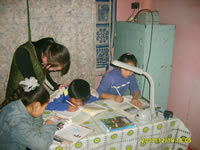 They have both made it to a school in a province called Dundgobi where Mercy Corps work. The school itself has recently had some repairs carried out to it, funded by Mercy Corps, but the facilities are very basic. The school also has the poorest student body in the area because a lot of children come from very poor herders' families and are housed in a rather miserable dormitory in the school. So the new equipment that you kindly donated is reaching the poorest children in Dundgobi and really making a difference to their lives. "The solar power source has been installed in the student dormitory. It’s kept ready and is used when local power is disconnected. Electricity is particularly bad in the winter, but since the Gobi Desert region has so much sunshine, the solar panel allows the students in the dorm to study even during the frequent, and long power outages." The laptop is also being used by teachers and pupils at the school to help them with their studies. They are keen to communicate with the school here in the UK that wrote them letters. I hope the pictures attached make it all come to life a bit more. 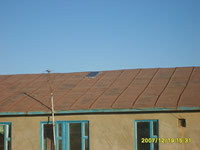 There are shots of the solar panel on the dormitory roof and children working under a electric light – powered by the solar panel, so that they can continue their school work. 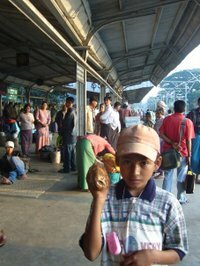 There are also some shots of children working on the laptop.